Preheat the oven to 350 degrees. Line a baking sheet with foil or parchment and set aside. In a bowl, whisk together the milk, egg whites and hot sauce. Add the yellow onions and toss until combined. In another medium bowl, add the panko crumbs. In another small bowl, add the flour. 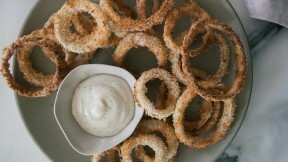 Dip the onion rings in the flour and then return them to the milk mixture. And then proceed to dip them in the bread crumbs. Transfer them to the baking sheet. Spray them lightly with cooking spray and sprinkle the onion rings with a few pinches of salt. Bake for 15 to 20 minutes, until browned and crispy.